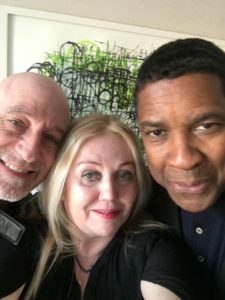 I order a Lyft car to go to the screening of Denzel Washington’s The Equaliser 2 in Century City Los Angeles. Traffic on Santa Monica Boulevard is murderous and I’m agitated. I decide to run in heels the rest of the way to make the screening and in the opening sequence I learn that Denzel’s character Robert McCall is an undercover Lyft driver. He’s also an avenging angel who rights wrongs violently and proficiently before anyone even asks. He is a dark force for good and he does a lot of his research while driving his Lyft. That’ll teach me to dismiss Grace. The Equaliser 2 is the first sequel of Washington’s career which has spanned 2 Oscars, 3 Globes and 1 Tony. Although the next day when we meet he’ll shrug and say, ‘Well, nobody ever asked me to do anything twice,” I think it’s because he doesn’t want to admit he’s close to this character and that’s why he was able to so effortlessly revive it. Also, there’s something perfect for the times that a powerful dark angel exists, a guy who can correct everything that goes wrong with brutality yes because you feel those wrongs. You root for him. It’s cathartic to watch. The fight scenes are powerful, fast, shocking. Washington himself has spent years in boxing training ever since he played Rubin Carter in the 1999 film The Hurricane. I’m in a suite at the Four Seasons Hotel. I hear him before he comes into the room. He’s got a great laugh – large, infectious and loud. And an even larger presence. He’s 6 foot 1 but seems taller in a black suit and black tee. Washington likes to banter, to distract. He asks questions about the wallpaper with the utmost curiosity. He doesn’t enjoy questions about himself which is odd for an actor, although there’s nothing about him that’s “Hollywood”. He grew up in Mount Vernon, New York. An odd buffer between the city and the rich Connecticut suburbs. It was mostly middle class. His father was a preacher who worked for the local water company by day and his mother owned beauty salons. They divorced when he was 14. His mother ruled him with tough love and tried to protect him from the bad boys. He went to college to study medicine, changed to political science, also considered law and journalism and ended up in a job where he could investigate all of these professions. He started off in the theatre honing his craft and, in many ways, feels that’s where he most belongs. He has revived A Raisin In The Sun and The Iceman Cometh on Broadway as well as Julius Caesar. He’ll stare at you but if you stare back he’ll look away. Does he have a star? “Do I?” he tries to recall. “No, I don’t, but I have hand and footprints. “Why don’t I have a star?” he wonders. We laugh but that’s really as he prefers it. An interview that’s not about him. Then he comes back to my Lyft driver and works out that it is his younger son Malcolm, 27 who’s twins with actress daughter Olivia, who played basketball a decade ago, although he won’t admit what he donated to the school or what basketball team he gave money to as Grace said he wouldn’t. He’s been married to Pauletta for 35 years by film industry standards, even if there was a lot of partying that’s rock solid. His older son John David, 33 started as a football player but got his big time break in HBO’s Ballers and is upcoming in Spike Lee’s movieBlacKkKlansman. His eldest daughter Katia 30 is a producer. She worked on her father’s movie Fences and Django Unchained. In all they’re a super successful family, revered by people like my Lyft driver for their unity and kindness but I were ever dare to say he’s a role model he would hate it more than he would hate being given a compliment. Partly because being a role model is a compliment, partly because although he’s very aware of the platform he has as a famous actor and a famous black actor, he never takes advantage of it. That’s just him. He started off his career where people thought he was a goody two shoes having total swallowed his bad boy past. That’s why I think he’s especially linked to this avenging angel character, McCall. Equaliser 2 is better than Equaliser 1 I tell him. “I’ve been hearing that but why? Is it because now you know the guy or is it because it’s more personal?” All of that and it’s actually more emotional. You invest in his relationship with his best friend – Susan played by Melissa Leo and you invest in the father/son quality of the relationship he has with Ashton Sanders’ character. Sanders shone in the Oscar winning Moonlight. He’s the kind of actor whose silence fills the screen with something deep. In this movie Sanders is a teenager on the brink. He can go to art school or he can join a gang. In real life Sanders is an artist as well as an actor. When I last met Washington, almost a year ago, he was very solid with Sanders and industry people told me he was mentoring him. Washington didn’t like that word but clearly he identified with him. I wonder if Washington saw in Sanders his own youth? He and his three best friends were all in a band. The others did not fare well. One died through drug related AIDS and at least two of the others spent many years in jail. One of them at least I know Washington helped out by buying him new teeth and there’s always the thought it could have been him had his mother not tough loved him right out of that bad boy set. In the movie Sanders character is poised to join the gang with the bad boys and Washington’s character saves him from that. Art reflecting life. It is remarkable of four friends, three are in jail or dead and the other is a full on movie star, reportedly worth $220 million. That’s why the scenes with Sanders are so impactful. How things could have gone. And he thought it was all about being a gangster. Washington nods slowly. This is sensitive, empathic Washington. You don’t see him for long and he refers it back to the movie. Washington has always found the fun in being serious or in straight up laughing at me. Laughing at my rambling questions, laughing at my attempts of accents but it’s not a cruel laugh, more playful and curious. In The Equaliser Robert McCall likes to read books. Washington replaced what was in the script with a book called Between the World and Me by Ta-Nehisi Coates. It’s a book written to the author’s teenage son about the feelings, symbolism and realities about growing up black in America. It discusses the racist violence that has been embedded into the American culture and this is the book that Washington chooses to give Sanders character. It’s not obvious. It never is. But this is as close as Washington gets to using his powerful platform as an African American. Washington likes detail. He’s not a natural preacher like his father although he could be a wonderful preacher. He is partial to an intriguing Bible quote and he himself once went to church with his mother and had the experience of speaking in tongues. Because it’s about growing up as an African American? It’s about being black? “Was there a question in there?” Well I’m just checking in which way the book relates as I haven’t actually read it. “Oh…ok,” says Washington, still not really wanting to go there. It’s not an ugly pause or a silent one. He doesn’t knock any questions back without laughing. In fact, he chortles quite a lot. He recently did a very funny interview on the Jimmy Kimmel show talking about how he saved the Oscars in 2016. The Oscars he saved were the notorious wrong envelope Oscars where Kimmel was hosting and was mystified when Faye Dunaway and Warren Beatty read out La La Land for Best Picture and there seemed to be something wrong. Washington looked at Kimmel and gestured to him to get Barry Jenkins the director of Moonlight. “I saved the Oscars. I didn’t win one. I must have been up for one because I was right down at the front.” He was absolutely up for Best Actor and Best Picture for Fences. He directed Fences adapted from the stage by August Wilson. His first Oscar nomination came for freedom fighter Steve Bilko in Cry Freedom (1988) and then for political martyr Malcolm X in 1993. His first win was for Training Day in 2002 although I think he should have won in 2000 for The Hurricane and 2013 for Flight. These days he likes to mix up his film work with some directing and the stage where he started off has become increasingly important to him. He’s just finished a couple of month’s run of The Iceman Cometh on Broadway. He likes to add personal details to scripts such as in this year’s Roman Israel he added the concept of his characters love of peanut butter. In The Equaliser he walks into a room and knows who’s there because of the smell. Asparagus tips and soy sauce and a specific ladies perfume. That was not in the script. It was from Washington because that’s what he does. Smells out the room before seeing it. “You don’t mean me personally? You mean the character.” I meant both. Today I looked up the definition of Denzel. “It means a fortress, right?” No actually. It’s a small town in Cornwall, England. Antoine Fuqua the director said that Washington and his Robert McCall character were alike because they like to do good and they didn’t want to be seen doing good. Is that so? Another quizzical look. I always assume he’s a leader. “Thank you. But a leader of what?” Of course, there are so many ways in which he could be a leader but he doesn’t want to assume any of them. Does he still have dream roles? Something he would look forward to or any projects he wants to direct? “I want to get back to doing some Shakespeare off the top of my head and plays by great writers. Be able to interpret August Wilson, Eugene O’Neill and William Shakespeare. That’s what I’ve been doing the last few years – acting in movies, acting in the theatre, directing movies so those three. That’s plenty. On most days he boxes. You can tell because of the way he spars onscreen. Very nimble. Listening to music is also a big part of his day. I don’t have a TV. I watch everything on my MacBook. “Really?” he says incredulous. Yeah, because if a TV dominates the room it’s too distracting. “That’s a good point. You go to dinner and look what happens. Everyone’s sitting around a table like this.” He mimes texting. Is that because you know the people you’re having dinner with so well you feel comfortable with them or you’re trying to avoid them? He laughs. “You’re speaking from experience and you’ve been on both sides,” he says knowingly and then checks his pockets. No wonder he’s wary of a newspaper interview. His daughter Olivia is an actress just starting out, honing her craft. Does he feel that she is safeguarded as a young woman in the industry? And all this from the man who says he is not an avenging angel. We’re in a high-rise New York hotel room. Outside is bitter cold. Denzel Washington is wearing an exquisitely tailored black suit and neatly coiffed hair. Very much the opposite to how I’ve just seen him in his new film Roman Israel Esq. It’s about a lawyer who is weirdly brilliant and also just weird. It’s about being a truth teller and how his life becomes undone. For most of the film he wears an oversized burgundy suit that seems to belong to part of the last century and sports a mini fro. I tell him of a chance encounter with the film’s hairstylist in the lobby who said ‘it was a collaborative idea. “Huh!” said Washington affronted. “It was my idea and my hair. Mini! That was seven months of hard work. It was the full fro. It was Billy Preston. I don’t want to talk to you now.” He theatrically folds his arms and leans back into the mock mid-century grey and teak couch. But this is adult Washington hair. He is 63 and coming into what he calls “the final quarter”. I’m not sure how his system of quarters works but turning 60 was a landmark for him. He wanted to concentrate on his physical and mental wellbeing, making sure he would explore more of the works of great American playwrights on stage and stay healthy enough for the physical demands. He doesn’t look like he’s nearing his final anything. He has a brooding and charismatic physical presence. He laughs a lot and when he laughs his eyes dart and his smile is very sparkly. He loves to chat. I’m not sure if he loves the process of the interview. Sometimes if he feels he’s being interrogated he just changes the subject completely. We circle back to the topic of hair. Isn’t it a bit spooky to keep hair? “I didn’t but I should have.” In a way this wasn’t Washington’s hair, it was Roman’s. The flawed lawyer savant he plays in the eponymously titled Roman Israel Esq. it was a movie written for him by director Dan Gilroy who felt Washington was the only person who could play it. It’s a nuanced and powerful performance which earned him a Golden Globe nomination. Gilroy was inspired by Washington’s 2012 Award winning performance in Flight. Gilroy was excited to see Washington do vulnerable. The scene that got him was the one at the end where the pilot with a sense of entitlement was brought down and admitted to being an alcoholic. That kind of vulnerability sustains Washington’s portrayal of Israel throughout the film. He’s generous on the brink of crazy. Smart on the brink of broken. Compulsive about peanut butter sandwiches eaten over the sink and the contents of his old fashioned big iPod. Somehow, he makes you root for him in the way that only Washington can do. This character is peculiar yet he is so human. Washington is never one for analysing or at least not in public. He doesn’t so much want to sit down and talk as sit down and play. And remind me of past interviews that I’ve done with him, particularly ones that did not go so well. He looks at me with a ‘Come on what have you got for me?’ expression. He often repeats a question as if he’s been asked it for the very first time but I’m sure there’s not a question he hasn’t been asked. Still we try. His football team is The Cowboys who were in the news recently for kneeling for the flag as a protest. Owner of The Cowboys threatened to send the kneelers home. What does he think? Washington has been married to Pauletta for 35 years – before his film career began. In public they show the kind of solidarity that comes with being together for such a long time. They have two sons and two daughters, all college graduates. His oldest daughter was a producer in the Oscar nominated Fences in which he both starred and directed. His oldest son played in the National Football league but now has a TV career. His youngest son graduated from the American Film Institute in directing and worked with Spike Lee and his youngest daughter has made her way in both film and stage. What advice did he give to his youngest daughter Olivia about her acting? “I actually said be the best, learn to act on stage not film. Don’t compromise, don’t be intimidated. It’s going well for her. She’s just finished the Taming of the Shrew with the Chicago Shakespeare Company. She is a working actress,” he says proudly. As the father of a 26-year-old daughter does he worry about the entertainment industry? Does he worry about the recent revelations where the powerful have abused the vulnerable? He’s nodding sagely. Does he think that the #metoo backlash will have a significant effect on the way the industry works? “I’m sure it already has. I’m sure there are those who thought they could get away with anything and they don’t feel that now. I mean I hope they don’t. I think it will change the industry for good. Hmm Harvey,” he reminisces. “It’s about 10 years. I haven’t talked to Harvey in about 10 years.” And with that Weinstein is dismissed. Washington is next up in a play on Broadway – The Eugene O’Neill heartbreaker The Iceman Cometh. A play for which the now disgraced Kevin Spacey received plaudits. How does he feel about stepping into Spacey’s shoes? “Whoah,” says Washington. “I’m not!” his eyes ignite with ferocity. So Washington’s come a long way from maybe you’ll do to having a movie written for him. “That’s what I’m hearing now. I’m glad I didn’t know that ahead of time.” Why? Because he would have felt too responsible? Too burdened? Washington does this often, distances himself from compliments, distances himself from responsibility – he knows deep down it really is all about him. It’s just that he doesn’t want to know. I tell him that I was at a Bafta Q&A where Gilroy said he had an epiphany moment while watching Washington’s performance in Flight the way he balanced power and vulnerability and that’s when he wanted to play someone who was flawed. I would have said he was more troubled than trouble. “Mmm…” Washington savours the thought. Gilroy said Washington came up with the idea of making him obsessed with peanut butter sandwiches. Didn’t he get bored with it? “That suggests I had options. I was more bored of starving. Washington grew up in Mount Vernon, a suburb of New York. His mother was as hairdresser, his father an ordained preacher. His mother saw that he fell in with a bad crowd at school and sent him to a strict military school. He doesn’t see much of his three best friends from school anymore. At least a couple of them have ended up as bad boys. “We used to ride the trains together, jump the turnstiles, go into town and hang out. When I did Julius Caesar on Broadway one showed up at the play. He’d been in the penal system for 28 years. Another one died, the third one is a chef doing OK and I am the fourth one.” Quite a difference between four friends. Washington has a primary school in New York named after him. 10 years ago, the Columbian Gorillas insisted they were only prepared to release three hostages if Washington was the negotiator. Washington is of course more than an actor and a director and sometimes he speaks like he too has been ordained. And the rest of the time he jokes around. He wanted to make his final quarter a healthier one? “Yes, yes. That too,” he says, now studying the gummy bears that remain – mostly green and a weird white one. Alcohol stopped giving him pleasure. He still likes boxing. He first discovered it when he played boxer Ruben “The Hurricane” Carter in the movie Hurricane. And has made it part of his regime. He looks powerful of course – tall, strong, but at the same time there’s something very soft and endearing. He’s a music fanatic too and was advisor on the movie’s soundtrack which is a mixture of 70’s classics and cool jazz. So just as you’ve got Washington down as this one-time bad boy who now likes to look after himself, the survivor of the friends, the one who remained the ultimate cool dude, he reminds you of a religious experience he had. I’d never thought of Washington following his father’s footsteps. I’d always had him down as more of a rebel but he is in fact there is a religious side to him and at one point he says the Holy Ghost came inside of him. He rebooted his Broadway career with Julius Caesar in 2005 and then there was Fences and A Raisin in the Sun. I saw him in a packed out short run of the latter with my mother. I think we paid $700 per ticket. Obama was a good guy in charge. A good President and a good man and now we have the opposite. “Well it’s early days yet…” Really? At this point the Fire and the Fury had not been released but Trump had pulled a few corkers like the flight ban from certain countries and not quite being able to explain his relationship with Russia and his potty mouth on Twitter. Does he really think that the current regime is inspiring? “Is it not?” he says ambiguously. OK, politics is not an inspiring conversation point for Washington. Although he’s sat in front of me, in his head he’s already left the room. Although he looked pretty mesmerised while watching Oprah’s Golden Globes speech. Ostensibly it was her acceptance speech for her Cecille B De Mille award but many are viewing its galvanising passion as a bid to run for the presidency in 2020. In response to the #metoo audience all wearing black she spoke about how speaking your truth is the most powerful thing to do and warned the abusers, “Time is up.” But then he comes back to explain his position on the black president followed by the orange one. “There’s a pastor talked about this. I think his name is A R Barnard and I think it’s Daniel Chapter 10. He says that God puts Kings in a place for a season and reason and we don’t always know the reason so this is what it is right now. There’s a reason behind it and I say to people if nothing else we should be more unified. All the more reason to work together.” He beams, rather godlike and then laughs. And it’s one final gummy bear before he goes.